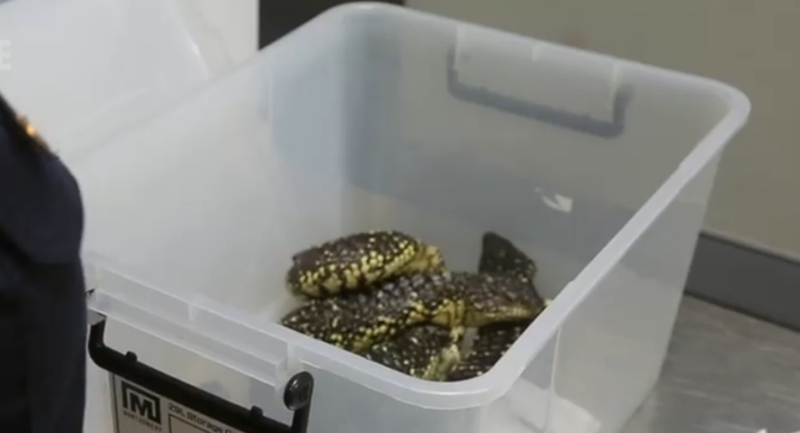 A man was arrested at Sydney Airport in Mascot, Australia, Wednesday after the Australian Border Force (ABF) found 10 shingleback lizards in his suitcase. The 46-year-old Japanese national, who was on his way back to Japan, was randomly selected by ABF officers for luggage inspection. The reptiles were found hidden in two trays covered with tissue paper and plastic tape. According to the ABF, who arrested and charged the unidentified man with one count of exporting regulated native specimens, the reptiles are native to Australia, and the flight back to Japan could have resulted in their deaths. The lizards will be handed over to the Taronga Zoo Wildlife Hospital to be cared for. "These lizards are beautiful animals, and it is obvious why they are appealing to wildlife smugglers. But the reality is they are a protected species, and the ABF will continue to do everything in our power to stop these criminal syndicates from exploiting them," ABF Regional Investigations Superintendent John Fleming said in a press release Wednesday. "The criminals involved in these operations have little regard for the animals' welfare, which is why our officers work hard to stop this incredibly cruel trade." "The community can also help us target these individuals — so I really encourage anyone with any information about the illegal removal of reptiles or who notice anything suspicious to contact the ABF's Borderwatch at australia.gov.au/borderwatch," he added. The maximum penalty for exporting regulated native specimens is 10 years' imprisonment or a fine of $210,000, or both. Shingleback Lizards are a protected species in Australia and are frequently sold by wildlife smugglers.